Aiming to investigate the histories and narratives of other people’s images and embrace broader themes such as loss, memory and mass cultural experiences, FOUND features seven artists, all of whom work in photographs, postcards and magazines collected from flea markets or the depths of the internet and archival collections. It’s a fascinating premise which provides much food for thought in an exhibition pointing towards the larger construct of ‘collective memory’ and how history and memory are presented and understood. 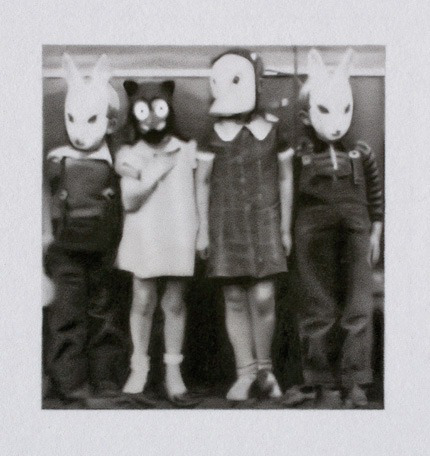 The work of two artists, Ruth Claxton and Paul Chiappe, is particularly striking. Chiappe produces meticulous pencil drawings of class photos, yearbooks and plays – important moments in the lives of strangers. Often mistaken for photos, his drawings blur the boundaries between fiction and reality. In essence, they seem to recall how self-conscious attempts to preserve memory (photographs, memorials and anniversaries) have given way to the spontaneous social remembrance of our digital age. Websites such as Facebook and Twitter represent an upsurge in memory with albums, tweets and memorial pages. But they also reflect the concurrent lack of ‘belonging’ to one social group – a kind of isolated collectivism, in which memories are shared on a grand scale. This is memory on the surface: highly visible but not forming a ‘lived experience’. It feeds nicely into Claxton’s work, whose wall of postcard photos of old master paintings each have their surface manipulated. For me, this encapsulates what the whole exhibition is about: the top surface of memory. Claxton’s postcards are meticulously stripped back to reveal the white space underneath – sometimes disrupting, sometimes in harmony with the original icon. This ‘white space’ of daily-life becomes a space of lost memories, in which new narratives can be placed. My only qualm about both of these works is to what extent they constitute ‘found’ objects. The word implies an element of happenstance and discovery, yet the imagery struck me as carefully selected. Artists Vesna Pavlovic and Erik Kessels deal with the ‘found’ brief more directly via discarded photographs. Pavlovic displays slides from a family’s travels across America, and Kessels’ room of enlarged botched vernacular photographs reveal amateur photographers who have accidentally concealed part of their image with their finger. Kessels aims to represent “the impulse to mark our lives and immortalise the past”, exploring the idea that by preserving our memories, we gradually and imperceptibly destroy them. – If an image exists in reality, what need is there to preserve it in the mind? Julie Cockburn, Ellen Gallagher and John Stezaker all seem to approach the brief from a similar standpoint by exploring social concepts of beauty. Stezaker’s montages of male and female Hollywood stars, their faces forming “exotic artefacts of an obsolete culture”, are elegantly juxtaposed. But for me, they are more about constructed, Hollywood movie symbols, rather than ‘found’ memory. Cockburn, likewise, transforms a set of 1940s/50s studio portrait photographs, all embellished by hand, and Gallagher’s African-American beauty images are painstakingly transmuted and modified. Cockburn’s embroidered images are the most visually arresting, with multicoloured neon threads encasing the sitter’s bodies. Like Claxton’s white spaces, the threads encase and restrain the original, but also add to the narrative. Like collective memory itself, the active processes of representation and involvement in FOUND ensures the narratives of others are kept alive – not through a traditional archival process, but one in which the artist, subject and viewer all play their individual parts. The exhibition runs until the 3rd of May, 2015. Entrance is free. For more information, see the New Art Gallery Walsall Website. Amelia Carruthers is a Bristol based writer and editor, interested in the arts, history and philosophy. She is passionate about art, literature and creative endeavours – activities which she believes should be accessible to as many people as possible. Reblogged this on Cat's Collections Diary.